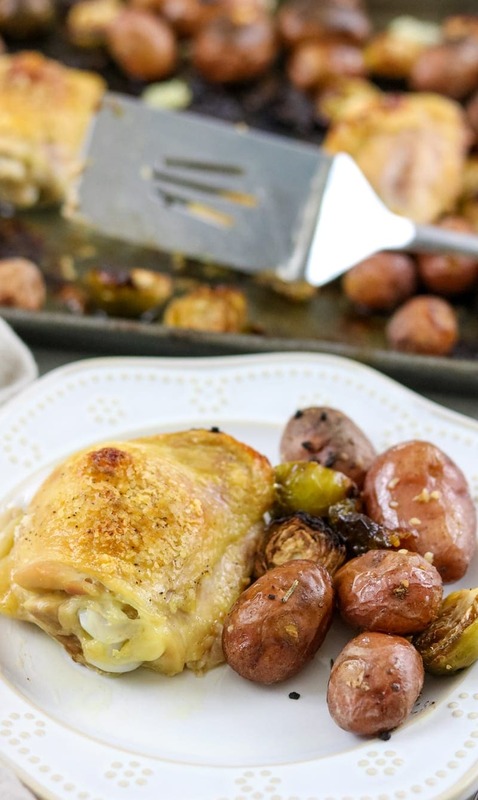 Easy Sheet Pan Chicken Dinner with Brussel Sprouts and Potatoes: Chicken thighs, brussel sprouts, and baby red potatoes roasted are roasted in garlic and fresh rosemary for an easy one pan dinner. I bet your week has been crazy too. 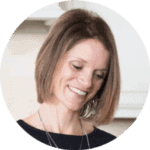 I bet you need easy dinner recipes that will put dinner on the table with MINIMAL effort on your part. Thankfully, I have you covered. There is something magical about sheet pan meals. One pan, some meat, vegetables and seasonings and place in oven and let dinner do it’s thing–while you do the other million things you have on your plate. And I bet you are with me on the One Pan Dinners—especially if you are on dishes duty. This Rosemary Roasted Chicken Thighs started because I needed a recipe for Chicken Thighs. But why just roast chicken, when you can make it a COMPLETE meal by adding on some veggies? You are totally with me on that, right?! One pan, one seasoning and DONE! 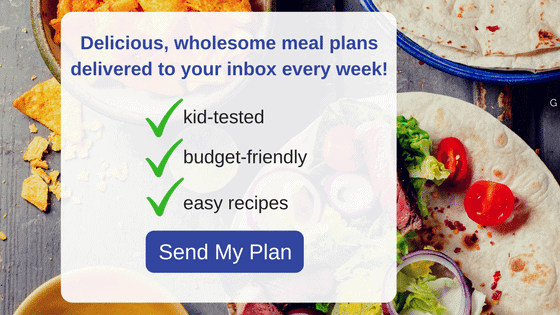 As you know, I love my One Pan Meals–like Quinoa Jambalaya, Tuscan Pork Skillet and Skillet Tilapia Veracruz. And because I know you are with me on that love for easy meals, I just had to share with you this recipe for Roasted Chicken Thighs with Vegetables. There is nothing facy about this chicken recipe. Just simple ingredients flavored with quality olive oil and fresh herbs. 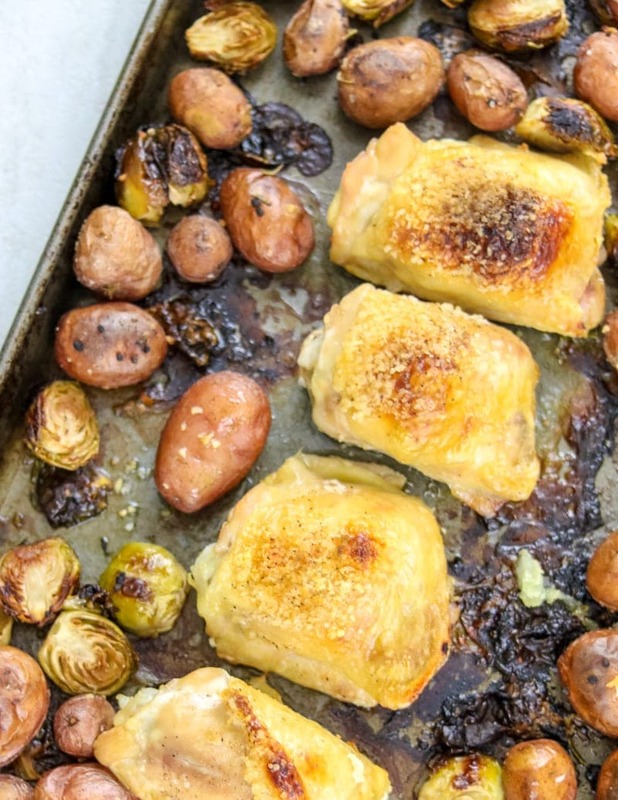 It all comes together with the magic of roasting–when the brussel sprouts caramelize and the potatoes get crispy on the outside and tender on the inside, and the chicken crips up while staying perfectly moist on the inside. Now that you are ready to eat, let’s get cooking! Bone-in Chicken Drumsticks, Breasts and Thighs all work in this roasted chicken dinner. You can opt to leave the skin on or off. Do NOT use boneless chicken, as the meat will dry out before the vegetables get caramelized. Roast your chicken to a temperature of 165 degrees (use a meat thermometer). Rosemary is a sturdy, hearty herb that works perfectly with roasted chicken and stands up well to be roasted. If you don’t have fresh rosemary, use 2 teaspoons dried rosemary. Have extra chicken thighs? Try out Crock-pot Balsamic Chicken Thighs or One-Pot Paprika Chicken Thighs. 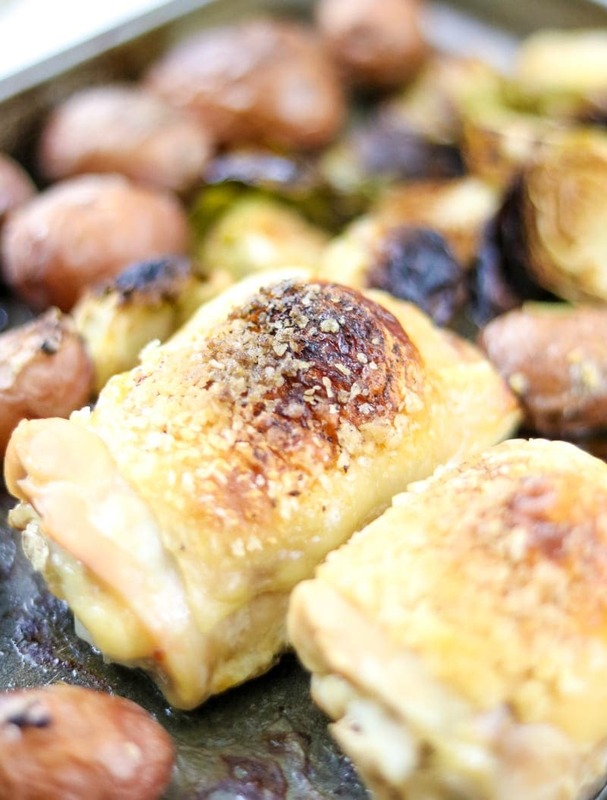 An easy sheet pan chicken dinner with brussel sprouts, potatoes and fresh rosemary. Toss the potatoes and brussel sprouts with the oil, rosemary, and 1 1/2 teapsoons salt and 1/2 teaspoon pepper. Spread on rimmed baking sheet. Nestle the chicken thighs in the vegetables and sprinkle with remaining salt and pepper. Roast for 30 minutes or until chicken reaches 165 degrees. 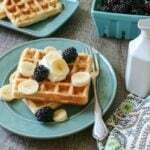 I know–it is a busy person’s dream come true and so versatile!